Nucleo Vega is an accomplished performer, educator, and author. He has a Masters in Jazz Performance from University of Maryland and his teachers include Mike Shepherd, Steve Fydik, Sean Rickman, Jeff Ballard, Dave Throckmorton, Robert Miller, Ron Barnett, and Chuck Redd. Nuc organizes jazz services in the Baltimore-D.C. Area, performing material from John Coltrane’s A Love Supreme album, and he tours with the award winning celtic/world ensemble, Harp 46, who has three albums in the top 10 of the World/New Age Billboards. Nuc performs with SAW-finalist jazz group Never in Denver, Euphonasia, Swingtopia, Mid-Atlantic Jazz Collegiate Orchestra, and members of D.C.’s military bands: Army Ambassadors, Navy Commodores, Army Blues, President’s Marine Band, Airmen of Note, and the Naval Academy Jazz Band. As an author and educator, Nuc was awarded the First Year Educator of the Year award in Howard County, Maryland. 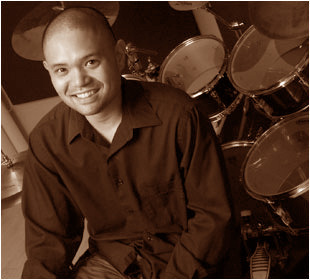 He went on to publish his first book at the age of 27: Mel Bay’s Understanding Groove for Drum Set, which was featured in Modern Drummer, Jazz Times, Drum Magazine, and Drummer Magazine. Understanding Groove was a finalist for Best Drum Book of the Year by Drum! magazine. Mel Bay’s Paradiddles Redefined for Drum Set was featured in Modern Drummer April 2010 and received rave reviews. Nucleo is currently working on his new book, Drummers Real Book: Jazz Melodies for Drum Set. For more information, visit: www.nucleovega.com and www.drummelody.com.